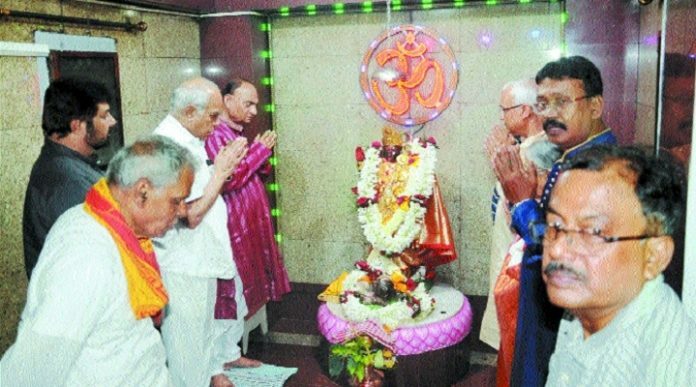 Nagpur : The 78th Sarbojanin Diwali Kali Puja 2018 celebration started after abhishek, aarti and other rituals being performed by Tamil Nadu Governor Banwarilal Purohit on Tuesday at Matri Mandir Kali Temple Dhantoli, Nagpur. The members of organising committee greeted and welcomed Purohit. Purohit appreciated the efforts by Puja Committee and its consistency in organising the same for 78th consecutive year. He also praised the sanctity and pure environment at the sanctum sanctorom of Matri Mandir, Kali Temple. Priest Ashok Chatterjee conducted the rituals. The members of Puja Committee for 2018 including Ravi Boratkar (Patron), S K Bhadury (President), Chhaya Mukherjee, Dr Santosh Dhamecha, B G Khatawkar, S S Guchhait, T D Mukherjee, Shivkumar Atulkar, S K Dev, Lily Mukherjee, Rita Sengupta, Uma Sen and Meera Banerjee (all Vice-Presidents), Narendra Biswas (General Secretary) Dr Sukdev Biswas (Organising Secretary), U K Bose (Joint Secretary), Shankar Saraswati, Debsish Bhattacharyya, Prithwish Sengupta, Samir Nandi, Biswajeet Debnath, Renuka Sarkar, Nemai Banarjee, Chhaya Mukherjee, Swapna Guchhait, Rita Sengupta, Sunil Dutta, Tapashi Ghosh, Moni Mishra, Papiya Dasgupta, Reba Pal, Ansul Nimje, Taran Singh, Diwakar Choudhury, Pranjali Nimje, S S Guchhait, D N Bag, B Pramanik, Pratul Bhattacharya, N K Saha, Ramesh Mandal, P K Sinha, Subroto Dutta, V K Gupta, Rakesh Palit, Sandhip Roy, Gautam Choudhury, C C Paine, Debashish Bhattachriya, Piyali Sengupta, Aniruddha Mukherjee, Arun Majumdar, D K Ghosh and many others were also present on this occasion.